In glorious sunshine, Mel and I drove to the airport. As the 'plane rose in the sky, the sun glittered. 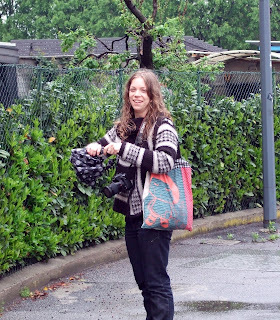 Armed with a case full of 'summer clothes', we descended into a dull Milan, rain hammering on the aeroplane engines and white lakes on the ground. The runway was wet as we landed and it was cold! Cold? Despite warnings of marauding gipsies, we arrived at the campsite with no threats or incidences at about midnight to erect our tents in the rain. I pulled the plug on my self inflating mattress expecting it to rise to at least 4 inches thick - nice and soft? It was like a sheet of 1" thick rubber! The bar was still open and we managed a couple of drinks. The tent and our clothes were damp and it was freezing! No sleep that night - or any night as it happens. On the second night I 'put my back out' and I have never known such agony. 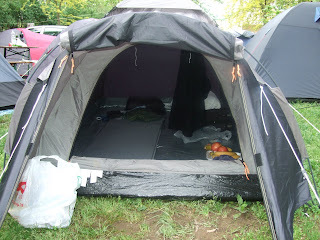 Getting into the tent was difficult enough, never mind getting my clothes off and into my sleeping bag. On the campsite we wondered why strange animals were kept. 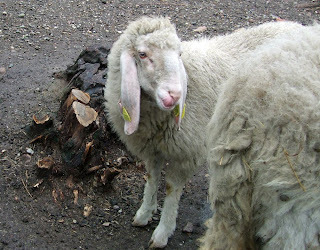 They looked like a cross between an Anglo Nubian goat and a sheep. 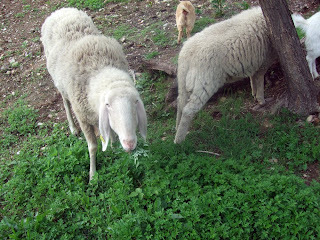 Later, we discovered they were the lawn mowers, let out each day to munch the grass between tents and caravans. What a good idea. Behind the camp site, there was a farm. Charlotte was fascinated by the beautiful peacocks, about six of them. and every night, one would start squawking followed by the rest and this was to continue all night, every night. Then the cockerels would start followed by the campanologists at the local church. On my last night, the peacocks echoed across the campsite and each time they squawked, there followed a cacophony of mimics. Very funny and I was amused that the whole campsite was awake. Hah! 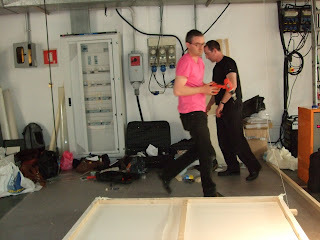 Tortona was alive with shows and the atmosphere was electric. There was not much Charlotte and I could do to help with the erection of the stand. 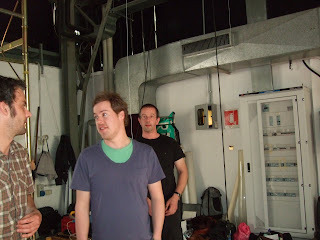 Andy and John Miller worked hard to erect the stand and work on time. Work hung. No lighting yet. We met some of the students from the Dutch stand next to us who had been working with adults with learning difficulties and between them, they created the above seat. 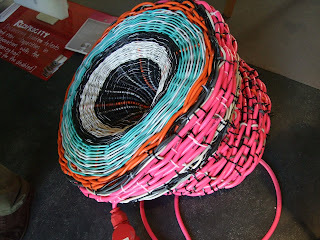 I loved Nina Riatano's silicon cups. I chatted to her about the use of silicon on fabric. 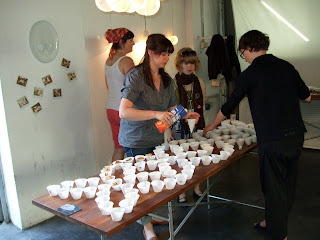 Laura Pregger's cup lighting was innovative and beautiful. They produced all sorts of constructions during the putting up of their stand but when set up, all that could be seen were a couple of tables. The 'set ups' were for their daily events. Each day at 5 p.m. they held a session to attract the customers to their stand, usually involving snacks and drinks. 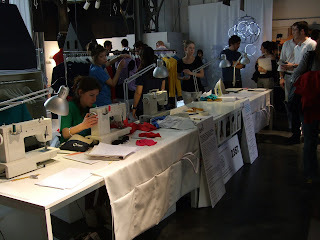 The Milan Poli had a line of sewing machines and the students continually made things. On the first day, collars and the second, tee shirts - an 'action' to catch the attention of the public. 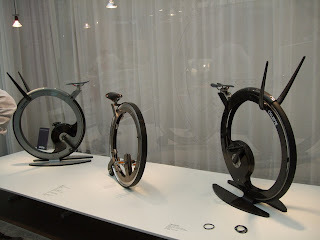 I spent some time with the interesting girl promoting her boyfriends bicycles. The two outside bikes are exercise bikes and the central one is a rideable bicycle. Apparently, he is a very introspective character and I so wanted to meet him, but didn't. 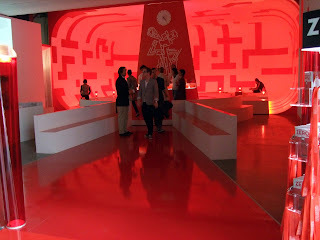 The Press View and Private View were absolutely crowded and this stand was dispensing free Campari. Alas, I was on a diet and not drinking. Olly and Ben we met at the campsite and what interesting guys they were. 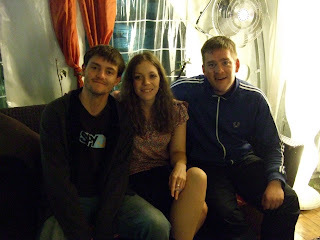 Olly was planning the Maccu Piccu trip to Peru, something I have always wanted to do. 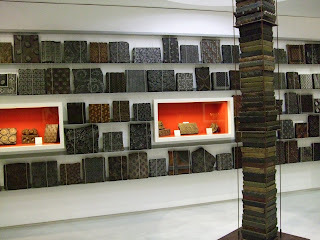 I have already talked about my wonderful day at the Zucchi Printing Block Museum. I was surprised to see so many errors in their texts which made me realise just how much precious and historic information I have. I working for David Evans for a whole summer. When exploring ties and visiting Turnbull and Asser, Jermyn Street in London, I found out that some of their ties were block printed by David Evans and there was a tie, the design of which I had engraved at David Evans. I hated working in the design studio. The designs were minuscule and tedious. 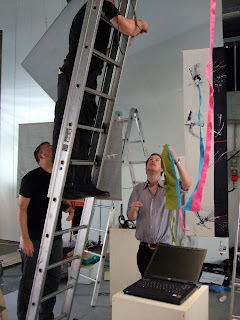 I eventually worked with the printers in the screen printing department, spending as much time as possible in the block printing area where only 4 block printers remained printing very expensive, exclusive silks. Staff gave me artifacts, photos etc. and the management gave me blocks, strike offs, block printed silks, and even a ledger of hand scripted, piece work pay for the block printers. I was told I could have any information I could write down, record or photograph. I worked like stink for the whole summer while staff worried about their jobs and not about saving the many historic artifacts despite my pleas to give them to a museum. 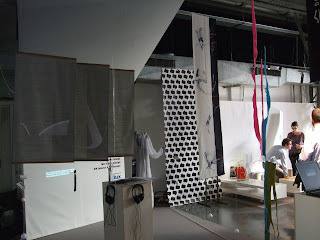 And the blocks, catalogued whilst I was there, ended up in the Zucchi museum in Milan. I later wrote my B.A. thesis on my stay, now a unique and historic document. Valentina at the Zucchi museum encouraged me to write my book - and I will. 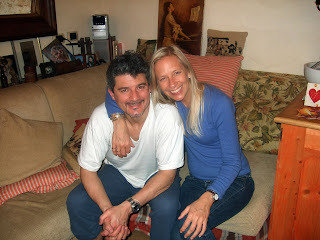 Finally, I spent two evenings with the gorgeous Sophie, my neighbour's niece who lives in Milan, and her partner, Carlo. On my last night, I couldn't have wished for anything more divine. Carlo runs a family delicatessen. 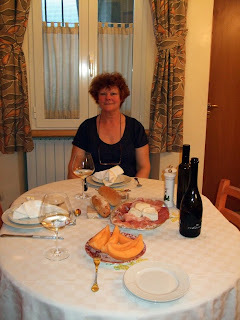 We started with melon, Italian parma hams and Italian cheeses, one we had with honey. Scrumptious! Carlo had made the biscuits and I have not tasted anything like them, a sort of cheesy shortbread with pistachios. We then had the most gorgeous lasagna with bechemal sauce and an Italian wine followed by an apricot tart Carlo had made and again - the pastry was unique and special, just out of this world. Then my last night on the sheet of rubber. The next morning I was having hallucinations of my soft bed and of soaking in a hot bath. My back was agony. I was delighted to hear many 'young-uns' complaining about their backs whilst sleeping on this self inflating bed! Oh how I appreciated my bed. It was like sleeping on a cloud and I slept and slept. My hot bath relieved my aches and soon I was back to normal?